The banner o Togo wis adoptit on Aprile 27, 1960. It haes five equal horizontal baunds o green (top an bottom) alternatin wi yellae. Thare is a white five-pointit starn on a reid square in the upper hoist-side corner. It uises the popular pan-African colors o Ethiopie, but the design resembles the banner o Liberie which itsel echoes the banner o the Unitit States. The banner wis designed bi airtist Paul Ahyi an approximates a golden rectangle closely. Ahyi (1930 – Januar 4, 2010) wis regardit as the greatest African airtists in the contemporary field. Born in Togo, Ahyi graduatit frae the École nationale supérieure des Beaux-Arts in Paris in 1959 an returned tae Togo. He designed the banner o Togo while wirkin on ither contemporary wirks. ↑ "Flag of Togo". FOTW.us. Flags Of The World. Retrieved 2007-06-09. ↑ "Paul Ahyi of Togo joins roster of UNESCO Artists for Peace". United Nations. 2009-09-11. Retrieved 2010-01-12. 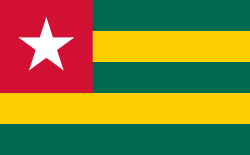 Wikimedia Commons haes media relatit tae Flags of Togo.